The White House National Security Council (NSC) paid over $1,000 for an unidentified guest to stay two nights at Donald Trump’s luxury resort Mar-a-Lago, according to an invoice obtained by transparency group Property of the People via a Freedom of Information Act (FOIA) request. This payment, made with a U.S. government charge card, constitutes the first documented violation by President Trump of the Constitution’s Domestic Emoluments Clause. President Trump owns 99.99% of Mar-a-Lago, LLC directly, and the company’s profits are held in a revocable trust from which Trump may withdraw funds without restriction. This and related documents were recently obtained via a FOIA request submitted by Property of the People as part of the organization’s Trump administration-specific transparency project, Operation 45. The NSC invoice is the strongest evidence uncovered to date that Trump’s refusal to divest from his business empire has resulted in Trump’s violation of the Constitution’s anti-corruption Domestic Emoluments Clause. This provision prohibits the President from receiving emoluments (profitable payments, benefits, or advantages) paid by federal or state governments, beyond the salary approved by Congress. A receipt from Donald Trump’s luxury Palm Beach resort Mar-a-Lago showing that the White House National Security Council was charged $1,092.00 for a guest to stay at the resort on March 3, and 4 of 2017. A copy of this invoice and several others can be reviewed in full HERE. The released documents show that Mar-A-Lago charged the NSC full price for the rented room instead of offering the NSC a discounted rate covering only the resort’s costs. 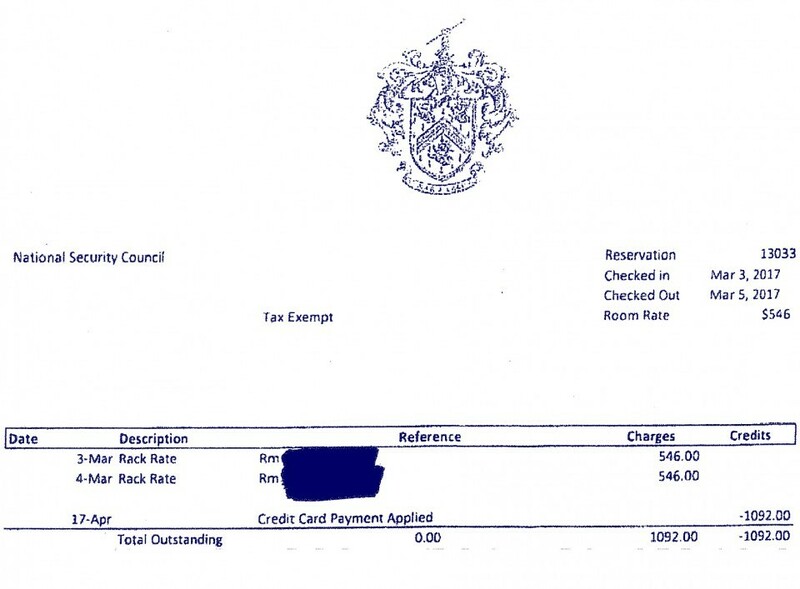 The NSC receipt lists the rate paid by the National Security Council as the “rack rate,” meaning the standard, non-discounted rate for the room. As such, the NSC’s payment to Mar-A-Lago constitutes a direct, profitable payment from a U.S. government agency to a business personally owned by Donald Trump. This is strong evidence of a violation by President Trump of the Domestic Emoluments Clause of the U.S. Constitution. 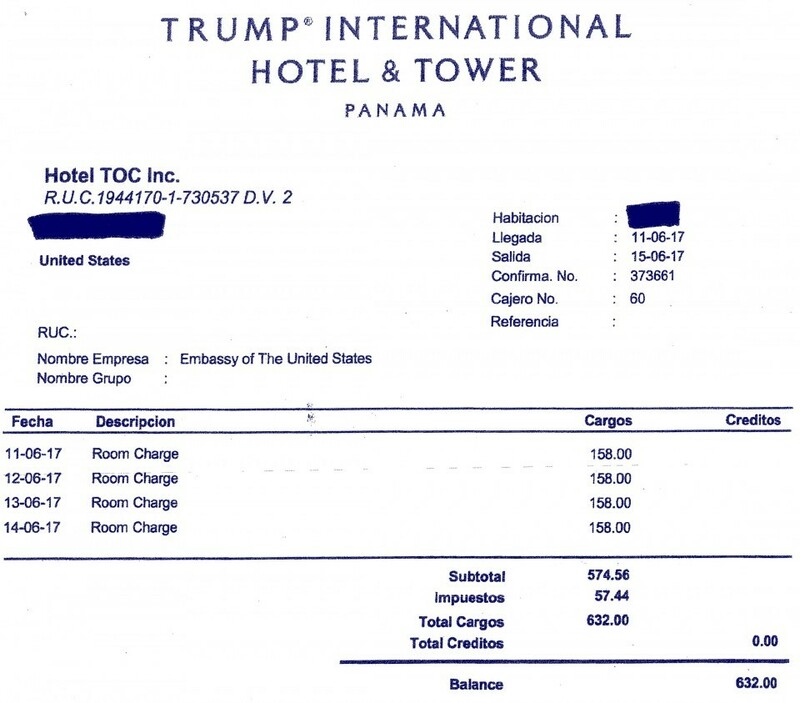 A receipt from Donald Trump’s exclusive Trump Ocean Club International Hotel & Tower in Panama showing that the US Embassy was charged $632.00 for a 4 night rental at the tower in June, 2017. A copy of this invoice and several others can be reviewed in full HERE. Property of the People also obtained invoices showing payments by the United States Embassy to Trump’s hotel in Panama, and documentation of payments by unidentified federal employees to Trump’s Washington, D.C. and Las Vegas hotels. These payments were all made on official U.S. government charge cards. They were obtained through Property of the People’s FOIA request to the United States Coast Guard, which administers the charge card program for the Department of Homeland Security. To date, discussion of the potential constitutional implications arising from Trump’s business holdings has focused primarily on the Foreign Emoluments Clause of the Constitution. Three lawsuits have now been filed against President Trump alleging violations of the Foreign Emoluments Clause, and legal scholars and cities across the country are already calling for Trump’s impeachment on grounds including Foreign Emoluments violations. Far less attention has paid to the Domestic Emoluments Clause. The documents just obtained by Property of the People are the first solid evidence uncovered of Trump’s violation of the Domestic Emoluments Clause. The National Security Council paid $1,092 for a March 3-4, 2017 stay at President Trump’s luxury Palm Beach, FL golf resort, Mar-a-Lago. The U.S. Embassy in Panama paid $632 for a March 23, 2017 stay at Donald Trump’s Trump International Hotel & Tower in Panama City. The Coast Guard paid $186.17 for a June 11-14, 2017 stay at Donald Trump’s Trump International Hotel & Tower in Las Vegas. The documents obtained by Property of the People also reveal the Coast Guard paid $62.40 for food or drink at the Trump International Hotel in Washington, DC on June 2, 2017. The documents were obtained in response to a FOIA request submitted by Property of the People to the United States Coast Guard. Property of the People is also pursuing the release of charge card records from other federal agencies to which the organization has submitted similar requests. These agencies include the United States Secret Service, the Department of State, the Department of Commerce, Customs and Border Patrol, the General Services Administration, and the Department of Defense. Ryan Shapiro is the co-founder and Director of Property of the People and a Ph.D. candidate at the Massachusetts Institute of Technology, as well as a former Research Affiliate at the Berkman Klein Center for Internet & Society at Harvard University. Shapiro is an historian of national security, the policing of dissent, and governmental transparency. Shapiro is widely known as a leading expert on the Freedom of Information Act (FOIA). Politico describes Shapiro as “a FOIA guru at the Massachusetts Institute of Technology.” Shapiro’s path-breaking FOIA work has led the FBI to declare his MIT dissertation research methodologies a threat to national security. In November 2016, Shapiro co-founded the non-profit transparency organization Property of the People, whose project Operation 45 seeks transparency and accountability from the Trump Administration. Shapiro is on twitter @_rshapiro. Property of the People and Shapiro are represented by Washington, DC based FOIA specialist attorney, Jeffrey Light. Light is on Twitter at @_lightlaw. Tagged DOJ, Domestic Emoluments Clause, donald trump, Emoluments, FOIA, Impeachment, Jeff Sessions, Mar-a-Lago, National Security Council, OP45, operation 45, Property of the People, ryan shapiro.